Quotes from ancient Greek and Roman philosophers and statesmen are still relevant today as guidelines for living wisely and compassionately. Putting this piece together has been a history lesson for me. These ancient Greek and Roman philosophers and statesmen used few words to express pearls of wisdom that stand up today as guidelines for living wisely and compassionately. From Heraclitus’ understanding of the ever-changing nature of life, to Epictetus’ and Seneca’s cautionary words about the perils of desire, to Aristotle advising us to educate the heart as well as the mind, there’s much food for thought here. Enjoy. Heraclitus (circa 535-475 BCE) is considered the most important pre-Socratic Greek philosopher. He was born in the Greek city of Ephesus. Little is known of his life and we have only a few sentences of his work. This last quotation is his most famous. It sounds both the theme of impermanence and the idea that our identities are fluid and ever-changing, so we need not get attached to the mental state of the moment and think we will be that way from now on. Pericles (circa 495-429 BCE) was the most prominent and influential Greek statesman and orator during the Golden Age of Athens. In 461, he became the ruler of Athens, a role he would occupy until his death. During his leadership, he built the Acropolis and the Parthenon and led Athens’ recapture of Delphi, the siege on Samos, and the invasion of Megara. In 429, he died of the plague. In my view, we’d do well to stick this last quotation on our refrigerators and read it every day. Socrates (circa 469—399 BCE) was a classical Greek philosopher and is considered one the founders of Western logic and philosophy. He established an ethical system based on human reason rather than theological doctrine. He maintained that the more we come to know ourselves, the greater will be our ability to reason and make choices that lead to true happiness. He is known to us mostly through the writings of his students, particularly Plato. When the political climate of Greece turned, Socrates was sentenced to death by hemlock poisoning in 399 BCE. He accepted this judgment rather than fleeing into exile. Plato (circa 428—348 BCE) was a Greek philosopher. Like Socrates, he is considered one of the founders of Western philosophy. He was a student of Socrates’ and a mentor to Aristotle. He founded The Academy of Athens, which was the first institute of higher learning in the Western world. I believe so strongly in the truth of this last statement that I don’t use the word evil anymore. When people do harm, I think of them as having acted out of ignorance. Aristotle (circa 384—322 BCE) was a Greek philosopher who is also considered one of the founders of Western philosophy. When he turned 17, he joined Plato’s Academy and stayed until he was 37. After Plato died, Aristotle left Athens and became a tutor for Alexander the Great. In 335, he founded the Lyceum in Athens. His writings cover an incredible array of subjects including physics, metaphysics, poetry, theater, music, logic, rhetoric, politics, ethics, and even biology and zoology. I’ve written a lot in this space and in my books about how believing our thoughts—particularly the stressful stories we tell ourselves about our lives—is a source of unhappiness and suffering for us. [Thus] each time our “thinking and pondering” gives rise to compassionate thoughts or compassionate action, our inclination to be compassionate is strengthened, making it more likely that we’ll behave compassionately in the future. We’re, in effect, planting a behavioral seed that can grow into a habit. We are forming our character. Seneca (circa 4 BCE—65 AD) was born in what is modern-day Cordoba, Spain. He was educated in Rome and became a Roman philosopher, statesman, dramatist, and even humorist. In 41 AD, he was banished to Corsica after being accused of adultery. Emperor Claudius’ wife insisted he be invited back to Rome and, upon returning, his reputation rose swiftly. He was a tutor and then chief advisor to Emperor Nero. He was ordered by Nero to commit suicide for supposed complicity in a conspiracy to assassinate the emperor. Seneca complied, but many historians think he was innocent. These six quotations from Seneca are gems to me because they reflect the way I aspire to live my life. Plutarch (circa 46—120 AD) was a Greek historian, biographer, and essayist. He lived in little, out-of-the-way Chaeroneia, Boetia, in Greece and spent his days lecturing and in friendly correspondence and conversation with many cultivated contemporaries among both Greeks and Romans. 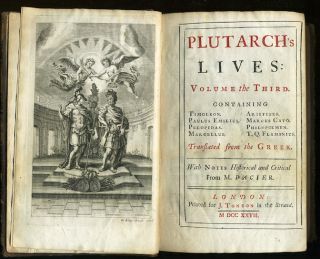 His famous work is a biography of Greek and Roman philosophers called Plutarch’s Lives. Epictetus (circa 55—135 AD) was a Greek sage. He was born a slave in what is modern-day Turkey. As a young man, he gained his freedom, moved to Rome, and began to teach philosophy. When philosophers were banished from Rome in 89 AD, Epictetus left and started his own school in Nicopolis in Northwest Greece, where he lived for the rest of his life. His teachings were written down and published by his pupil Arrian. This last quotation struck me so strongly as a model for how to live my own life that it currently sits as the final quotation in my upcoming book on chronic pain and illness. I hope you’ve enjoyed this excursion into ancient wisdom. Toni Bernhard is the author of the award-winning How to Be Sick: A Buddhist-Inspired Guide for the Chronically Ill and their Caregivers, and How to Wake Up: A Buddhist-Inspired Guide to Navigating Joy and Sorrow. Her newest book is called How to Live Well with Chronic Pain and Illness: A Mindful Guide. Before becoming chronically ill, she was a law professor at the University of California—Davis. Her blog, “Turning Straw Into Gold” is hosted by Psychology Today online. Visit her website at www.tonibernhard.com. Using the envelope icon, you can email this piece to others. I’m active on Facebook, Pinterest, and Twitter.